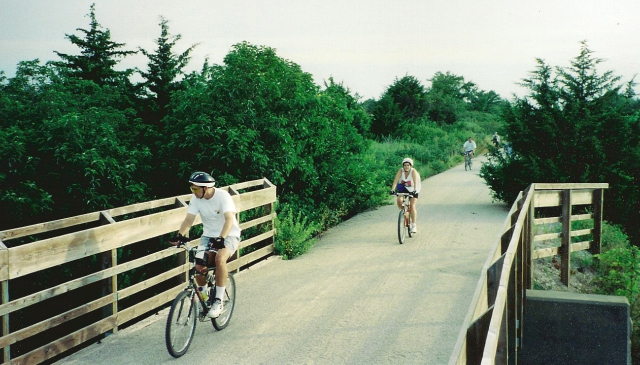 Just as national studies show an increase in walking, jogging and bicycling as primary choices for physical exercise, the 51-mile Prairie Spirit Rail Trail leads the state as the longest rail-trail in Kansas, providing hundreds of visitors each year a glimpse of Kansas’ natural treasures and best kept secrets. The Prairie Spirit Trail, a part of the National Rail Trail Network, is a multi-use trail designed for hiking and biking; non-motorized use. The trail spans across the three Kansas counties of Allen, Anderson and Franklin and connects the communities of Ottawa, Princeton, Richmond, Scipio, Garnett, Welda, Colony, Carlyle and Iola. The trail’s surface is approximately 12 feet wide and outside the city limits of Garnett, Iola and Ottawa it is composed of a hard-packed mixture of limestone and calcium chloride. Inside Garnett, Iola and Ottawa the surface of the trail is asphalt. No permits are required inside these city limits. Trail passes are required for persons 16 years and older who travel outside these aforementioned city limits. Created in 3 phases, Phase I from Richmond to Welda opened to the public on March 30, 1996. Phase 2, Ottawa to Richmond was completed in the sprint of 1998. Phase 3, Iola to Welda was opened for public use in the fall of 2008. The trail is managed and maintained by the Kansas Department of Wildlife and Parks. Through agreements with the cities of Iola, Garnett and Ottawa, trail maintenance within city limits are provided by those cities. As the seasons change in Kansas, the Prairie Spirit displays an ongoing change of beautiful scenery. From tall grasses to towering trees, the countryside shows off a variety of vibrant colors. The Prairie Spirit Trail is lined with lush wildflowers, such as the famous Kansas sunflowers which are brilliant in August, May apple, Dutchman breeches, Queen Anne’s lace, butterfly milkweed, ox-eye daises, and many more. Commonly seen habitat along the trail include white-tailed deer, quail, cottontail rabbits, great horned owls, and a variety of songbirds. Whether an avid cyclist or the casual explorer of small town hospitality, the Prairie Spirit Trail has something for everyone. Trail trekkers enjoy venturing over the many bridges which cross ponds, creeks, and the Marias De Cygne River, unique barns and other structures, and the lakeside scenery found on both sides of Garnett when crossing the dam at Crystal Lake to the south and passing by Lake Garnett to the north. RV camping and picnic areas are readily accessible at these lakes for trail users. Garnett is virtually the midway point on the Prairie Spirit Trail. Geocaching is also an entertaining outdoor adventure opportunity on the Prairie Spirit Trail, utilizing GPS units to discover pre-placed treasures. The Prairie Spirit Trail as well as the other 25 Kansas State Parks and three wildlife areas are participating in the program for a total of 29 official KDWP geocaching. To obtain coordinates of the geocache in each park and for complete details of the program go to www.kdwp.state.ks.us. To the casual explorer, the communities along the Prairie Spirit are home to many unique shops, eateries, historical sites and cultural experiences to enjoy. Those staying the night can find rest at one of many lodging venues including motels, bed and breakfasts or scenic camping areas.